We arrived to Meganisi by the end of June, after some weeks sailing in the Mediterranean sea during the mid season (at that time, most of the boats that we came across at the anchorages where liveaboards). We spent July in the nice Ionian islands (from Olympia to Corfu); some places were very touristic with plenty of charters boats and people spending one or two weeks of holidays sailing. We also knew at that time that we were on our way back to France for a break in our sailing. It was great to be in such beautiful islands to start digesting all the thoughts, emotions and feelings of the previous year. 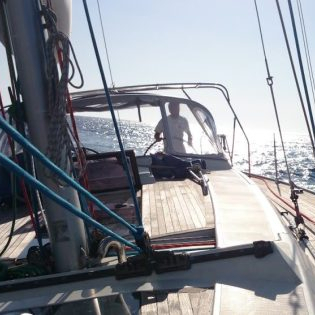 We have been only sailing for a month in the Ionian (July). We started in the middle (Meganisis) and we headed south (Olympia) and then north (up to Corfu), in our experience and taking into consideration the conversations that we had with other sailors that we crossed, the wind is most of the time blowing from the N/NW from the Adriatic sea, it is light winds but you have to take into consideration the local wind effects between the islands, wind can go up to 20 knots very quickly in the afternoon. It is not the famous Greek Meltemi, more like of an introduction to it. There is usually only wind in the afternoon and nights and morning are quiet. SV Dunia is based is in Preveza and they had been sailing in the Ionians for 5 summers, I can now understand why Judith was handling SV Dunia so well! Ladies: it is only a question of practice! a lot of chain (we have 80 meters, some have 100 meters) – because it is hard to estimate how far you are from the shore… and you really don’t want to have the manoeuvre all over again because you’re missing 5 meters. Also, when the wind comes from the side, you’d better have a lot of chain to hold. At least 2 landlines (we had one 50 meter line and 35 meter line, both in 16mm). Floating lines are usually more practical (because they… float) and lighter. We could not find any in Preveza, so we got one extra line. Chains (we had two 2 meter long 8 mm diameter chain) and/or toughened lines (Pierre made some by running spare lines into spare halyard sleeves) in order to tie to the rocks. We prefer to used the toughened lines as they are less aggressive to the rocks (we used the chains in some marinas were there was no proper bollard or rings in the quay). PLEASE, do not tie to the trees. It is very tempting to use the trees because it is so easy to do and nice on the lines… BUT this is just too much for those Mediterranean trees: they need dozens of years to grow there and just a couple of careless sailors to die. Plus they just have roots around the rocks, so they might just no hold enough. So, take the extra time to look for nice rocks to tie your line, you don’t want to be this kind of careless sailor. In most of the cities you will find the town quay where you can moor for a very affordable price and even for free some time. Of course, you get the service you paid for: sometime not much (water, electricity, bollards or rings are not always available), you might have to be creative and tie to some exotic stuff. Most of the time, you will have to drop your anchor and back up to the quay – which is a challenging manoeuvre, especially with the wind from the side. There are some well equipped marinas, with very good services and corresponding rates. Based on the usually winds for the summer, sailing south is usually a nice and slow sail (we did two of those southbound passages at night during). Heading north into the wind is more challenging because the route is longer (tacking) and there is not much time with proper wind. Most of the time, we struggled in finding the right moment to leave: when leaving early in the morning, we had to motor most of the day but anchoring was easy (no wind), when leaving later, the wind was nice for one hour then picked up to 20 knots and when arriving to the anchorage most spots were crowded. Based on our experience, going North to South in the Ionians is really more comfortable. Most professional (ferries and fishing) boats have AIS (it is mandatory on 24+ m boats); most other boats don’t. Usually, there is not much traffic at night – but be careful with charter boats motoring full speed for their last night, without paying attention to anyone. Despite of the tourism, we really loved the Ionians and enjoyed every place that we visited (Meganisi, Preveza, Kephalonia, Katakolo, Zakinthos, Mesalongi, Kastos, Pargas, Paxos, Corfu, …) We were surprised by the authenticity of most places, you could feel the history when you were walking around. The sea and the coast are one of the most beautiful that we have ever seen, transparent waters, olives trees, ochre rocks… We discovered some nice tiny anchorage or calm anchorages with few boats during the day. The food does not vary much but we surely enjoyed the tzatziki, the fried fish and the pork chops. We struggled a bit communicating with locals. The services were good and locals are very friendly but when we tried to talk about something unrelated to the tourism or boat services, we were unable to connect, most probably due to the language barrier. I also found a bigger difference between locals and tourists in Greece than in the other European countries that we visited. In most of the places that went in Greece, restaurants where aimed at tourists and full of tourists ; even when we rented a car in Corfu and tried to find some tiny local typical restaurant. During our day trip in Corfu by car, we were amazed to see the tons of bins plastic bags on the roadside, spreading over hundreds of meters. From what we learn, they have an issue with the waste treatment and during the summer, in the high season, they do not know what to do with the wastes and the throw them away on the road… which is a pity. It usually takes 10 months to pick up all the rubbish over the year, until the next summer arrives. I hope they will find a way to treat the waste in a more sustainable and environmental healthy way. Having a couple of amazing girly drinks meanwhile the rest of the crew were watching the football world cup. Thanks ladies for the good time! We missed other families and friends, we would have loved to see them but we had to be back in France by the end of August. How’s your experience about sailing around the Ionian islands? Feel free to add comment with your experience. If there is something that you think would add value to this article, please contact me and I will update it.